Cavechat.org • View topic - Conservation: What? Why? The NSS puts much importance, officially, on cave conservation. Many of its members take cave conservation very seriously. Most of them have, or claim to have, real concern for conserving the cave environment. Conversation about conservation is applied to an extremely wide variety of activity (or inactivity). "Caving softly," marking trails, gating, speleothem restoration, graffiti and trash removal, abstinence, (and more, help me out)... these are all included in discussions about conservation. For me, the frequent references to conservation and its importance raise a few questions that I'm struggling with. I know that these things have been discussed, in conversation and surely in print, and your insights or any references to pertinent information would be good. What really is conservation? The definition is fairly simple, and generally boils down to: the protection of resources from long-term harm. So, we need to identify cave resources that are commonly held to need protection. This is simple for many, requiring only the simple acceptance of a widespread delusion: that each and every component of each and every cave is inherently precious, and is more precious than other similar or identical objects outside of the cave environment. That this attitude exists is a demonstrable fact. That it is indeed a delusion may be fodder for argument. At any rate, it doesn't do it for me. To me, "cave resources" are aesthetic, biologic, recreational, historical, scientific, and their relative importance is directly linked to the ability of humans to appreciate them, and to a very limited extent, their rarity (which sometimes amounts to the same thing, given our fascination with the unusual). The fact that something happens to exist in a cave makes it no more or less special. A stalactite is a resource because it is pretty, an eyeless fish is a resource because it fascinates us, the Lascaux paintings are a resource for basically the same reason... then things start to get fuzzy. Are bacteria and minute organisms within cave sediment a resource? Maybe to a scientist. So why do the rest of us pretend we care about them? I feel that every living thing has value, but that their values are relative to our comfort, convenience, and personal preferences. This might sound like a selfish way of looking at things, but as the only self-aware creatures on the planet, isn't it our right? Most of us, if we're honest, feel the same way, and demonstrate these feelings every time we kill a spider or a mouse in our house, or hit a bird with our car, or eat bacon. Do we allow ourselves to cultivate shallow hypocrisies in the interest of looking good? Other questions involve the setting of conservational efforts. Does hauling around a jug of your urine while surveying an almost-never-visited cave make you a conservationist? What resource are you protecting? Is it more precious than your comfort and convenience? 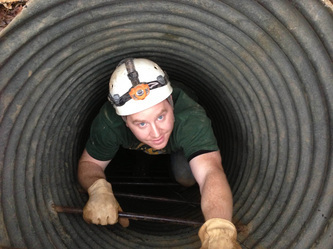 Does dragging scrap metal and tires out of a secluded sinkhole make you a conservationist? What resource are you protecting? Is it more important than your time? Of course, the way you use your time is a personal thing, and if something really matters to you, then that's great. But should we feel pressured, or pressure others, to conform to an artificial ethic of conservation? There are lots of other sides to this issue, lots of situational complications. I'm not able, right now, to give voice to all the stuff flopping around my tired brain. This is a respectful call for information, clarification, introspection. I would never encourage careless treatment of the cave environment. I view myself as a person of conscience. While I'm not looking to others to legitimize viewpoints that I have thoughtfully cultivated, I have and will continue to amend my them on the basis of increased knowledge. That there's my ramble from a few nights ago. Bear with me, blame insomnia, blast away! I think this is a deep subject and one that cavers should be able to answer when asked by the general public. You're right that conservation, by definition, must mean that you are conserving something. Actions that don't do that is a waste. I like to break down effects into likelyhood of impact, magnitude of impact, and longevity of impact. Using these we can create a matrix to make decisions. Evaluation 1: "No one should go on Mammoth Cave tours because they will get injured and damage the cave." Likelyhood -- possible to get injured, but not probable (I don't have the forest service data on injuries). Magnitude -- Cavers are kept away from places where they will damage the cave if they get injured so impact will be small and their body will be removed fully after the accident. Longevity -- between hours and days depending on whether the injury is minor or results in death. Evaluation 2: "You shouldn't walk through a formation room if you don't have to." Likelyhood -- damage is expected within 100 trips especially in deeper parts of the cave where cavers will be tired. Magnitude -- a formation will be destroyed, and repeat offences will have a cumulative effect. Longevity -- thousands of years to recover from the damage. Evaluation 3: "Removing junk from a sink hole is conservation." Likelyhood -- depends on what is in the sink hole and whether it will pollute our water supply or whether is has an aesthetic impact. Magnitude -- depends on what's in the hole and how bad it looks. Longevity -- depends on what is in the hole and how quickly it will be re-filled. This one is much harder to evaluate as conservation without knowing what is being conserved. That being said, I think sink hole clean-ups are always a good thing. I'm just not sure they are always conservation. Comment: This discussion shouldn't confuse "conservation" (protection of resources from long-term harm while enjoying them in a responsible way) vs. "preservation" (keeping the resource as close to pristine as possible even to the level of exclusion of human activity that may affect it). The mission of the National Forests, for example, is conservation...which allows cutting of acres of NFS trees as long as the trees are replaced\replanted) while the National Parks mission, nominally, is preservation...removing trees only if they endanger humans or human construction (which, if they stuck to the letter of their mission, would not be there in the first place). Wilderness Areas are for total preservation (no roads, no picnic tables, nothing but footprints). I think most cavers would see non-commercial caves as wilderness areas...no "improvements" required - not trails, not bridges, not lights. I even question gates which leave a human imprint on the most highly visible and always-traveled area of a cave. They are a scar and a reminder of human intervention. For me, conservation is not as you describe, mainly because I don't feel conserving one thing and working focused on that thing devalues anything else. Conservation is, I feel, the duty of people to recognize that we are neither the only people who will ever live nor are we creatures imbued with some inherent right to damage or destroy the habitats of other creatures. I do not consider the cave environment more important then any other environment, or assume that things inside a cave are more valuable. I think I have the duty to conserve everything that I can, caves included. The reason I focus my conservation efforts on caves is because I, personally, subjectively, care about and enjoy them. Since I cannot conserve everything in the world, and I have limited personal time and resources, I choose to spend those on the things I understand and most enjoy. I am not, by doing so, denying the conservation need in other areas--I am merely choosing where to place my own small effort. JSDunham wrote: For me, conservation is not as you describe, mainly because I don't feel conserving one thing and working focused on that thing devalues anything else. Really, I'm not trying to say that conservation devalues anything either. I'm saying that so-called conservation is sometimes not conservation at all, and artificially inflates the value of "cave resources". GroundquestMSA wrote: Really, I'm not trying to say that conservation devalues anything either. I'm saying that so-called conservation is sometimes not conservation at all, and artificially inflates the value of "cave resources". I don't think I've seen anything to suggest that myself--are you thinking of a particular example? There are a couple in my opening post. Sinkhole cleanups and piss packing. Both are fine, both are sometimes conservation, but neither are particularly meaningful in cases where no resource is being protected. It's just another example of our habit of action based on broad vagaries instead of formulating real, meaningful, specific, practical principles. Another example is found near my home. I wrote an article for the News (April 2013) about the Rocky Fork Gorge and the "conservation" taking place there after more than a century of vandalism and heavy traffic. Closing the caves is called conservation by the new owner, but it's false conservation. What are the resources being protected? Most of the aesthetic resources are completely destroyed and will not recover, no matter what we do. There are no significant biological resources. Therefore, the primary resources these caves provide are educational and recreational ones. Closing the caves then, is very nearly the opposite of conservation since it wastes these resources. I haven't checked, but I would bet that an objective look back at the Conservation Issues of the News over the years would reveal similarly fallacious examples initiated by cavers... which is not a criticism. This isn't a life and death issue, and I have no doubt that the motives behind most conservational efforts are noble. I have nothing against anyone's sincere efforts to conserve, this is just my way of thinking through things in a quest for clarity. Well, I guess I would agree with your second example, but, like you, I would consider that false conservation, not an example of conservation itself being a problem. If your main point is that poorly-formed ideas of conservation can lead to actions that are irrelevant or harmful, I perhaps missed that in the original post and I would totally agree. In the case of this example, I would say closing caves that are already irreparably damaged is generally a net loss, because it is both a product of the false idea that conservation is incompatible with human use and it encourages those who don't know better to go elsewhere and potentially damage more pristine resources. Sacrificial caves play an important role, in my opinion, in getting people into caving and helping them understand the cave environment in a low-stakes situation, and cleanups of those caves I think are also helpful because they demonstrate to the visitors that people do care about experiencing a more pristine environment and lead them to think more deeply about it. I guess I read your first post as implying that the entire idea of conservation is tainted by such things, however, which I wouldn't agree with (though perhaps you didn't mean that). Sinkhole cleanups, however, I think are an example of well-considered conservation, both because they help protect groundwater resources (which are essential for everyone, human and not, in and out of caves) and because they present landowners with examples of people who care about such resources and encourage them to think differently about waste disposal. Piss packing, likewise, may be a valuable conservation tool. I don't think it is strictly necessary in every cave environment, especially if there is substantial throughput of water and surface debris. The main reason for piss packing, in my view, is that the microbial life that breaks down animal waste on the surface is not present in many caves, so waste left in the cave will not decompose normally and may even harm otherwise isolated cave ecosystems by introducing foreign microbial life. In general, I think conservation is the practice of recognizing intrinsic value in the places and ecosystems we interact with and acting to avoid damaging that value. When used as a cudgel, I think conservation can be an excuse to exclude people rather than a tool for making sure the needs of an environment are given equal weight. I also think it can be a wonderful tool for a careful and mindful interaction with, at least for me, the places I care about. When possible, I endeavor to teach the latter and discourage the former, so for me it is important that the NSS, with focus on science, conservation, recreation, and education, do so as well, and do so in a way that showcases those things working together rather than being at odds. If WNS has shown us anything, it is, in my mind, the failure of many government agencies to do that effectively; thus I think the NSS is one of the few advocates for balancing these needs in the cave environment. If you excuse me for being long-winded in getting there, I think that pretty well sums up view of cave conservation and reasons for engaging in it.